Langres cheese is made in the high plains of Champagne and is traced back from the 18th century. There's a depression at the top of the cheese called a "fonataine" or "cuvette" and is there intentionall so that you can pour Champagne in it. The Champagne adds to the flavor of the cheese and gives it a slight effervescence. This cheese is riped in a very humid cellar and then is washed regularly with an orange pigment to provide a slight color. The smell of this cheese is pretty strong but it does melt in your mouth with a complex flavor. Langres is best served on a cheese board or with a salad. This cheese is also known under the name of Boule de Lille because they were originally matured in cellars situated in the town of Lille. The pate is semi-hard, pressed and has a colour of orange due to the natural Rocou colouring. The Mimolette is at its best after 18 months of maturing: the pate becomes hard and crumbly with a salty, perfumed taste. An excellent cheese for the kitchen, on a savory appetizer, in salads either grated or in cubes. The flavor of this cheese is very much like a cheddar but with a slight sweetness. Saint Nectaire is an ancient cheese, similar to cheeses made in monasteries. Milk from cows grazing in the Auverge mountains are used to make Saint Nectaire. The milk is heated and coagulated with rennet. The curd is then pressed into the molds by hand. The cheese is then removed, salted and wrapped in cloth.... and is pressed once again. Saint Nectaire cheeses age in cellars for a minimum of three weeks. This cheese has a nutty and fruity flavor with a touch of salt and spice, best served on a cheeseboard. Chevre in French simply means goat. 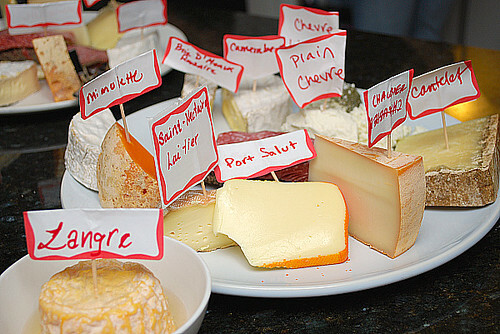 Chevre cheeses come in a variety of sizes and shapes, including cones, cylingers, discs, drumbs, and pyramids. The cheeses are often covered with ask or leaves, herbs or pepper. When Chevre is young, it's mild and creamy... whereas when it's older, the cheese is dry and firm with a slightly sharp and lightly acidic flavor. This cheese is best stored in a refrigerator for up to 2 weeks. Chevre is especially delicious with French bread, avocado, olives or figs and is used in salads, omelets, pizza toppings and souffles. Port Salut is a semi-soft natural cheese that is most recognized by its orange rind. It is rather mild with a savory, sweet flavor, unlike many other French cheeses. It is a cheese that has universal appeal with its smooth, velvety texture and light acidic taste. The pâte is elastic, cream-colored, soft, and supple with a very faint aroma. Port Salut keeps well for several weeks, or longer, if securely wrapped. This is a perfect cheese to partner with fruit and makes for a great cheese board. This Chaubier is a mi-chevre, meaning half goat. It's other half is made of cow's milk. Chaubier is a semi-firm cheese that is cooked, pressed and washed rind. The texture is smooth, mild and supple but it has a distinct goat's milk flavor. Cantal (Cantalet) is one of the oldest cheese in France. Even Pliny the Elder mentioned Cantal cheese (1st Century AD). Cantal cheese is named after the Cantal Mountains in Auvergne, France where the cheese comes from. Cantal is made from pasteurized cow's milk which is first heated and pressed. The Cantal is then left for 8 hours to develop. It's then salted and pressed again 3-4 times. Cantal is ready to reast for at least one month for a young cheese, up to 6 months for a medium cheese and 6 months or longer for an older cheese. The older the Cantal cheese is, the stronger the flavor. Usually Cantal has a milky aroma with a nutty flavor. Camembert is one of the most famous cheeses in France, and dates back only to the 18th century. This cheese is named after a Norman village Camembert. In 1855 the cheese was presented to Napoleon, introduced as being from the village of Camembert. Napoleon enjoyed the cheese so much that from that moment Camembert became know everywhere by its cheese. The cheese is made from pasteurized cow's milk. At the beginning of its ripening, Camembert is crumbly and soft, but gets creamier over time (usually 2-3 weeks.) The taste is fairly delicate and salty. It's especially delicious with baguette bread and is great served with fruits or nuts, best eaten at room temperature. Brie D'Meaux was once declared "Le Roi des Fromages" (the King of Cheeses.) Of the many types of Brie, Brie D'Meaux is probably the finest and most widely best known in France. This cheese has a subtle sweetness and has a soft combination of hazelnuts and fruit aromas. It's delicious paired with Champagne. You always throw the coolest events! This looks like so much fun. And your post is so informative. Love it! Looks like a fantastic evening! Langres is one of my all time favorites. And those crêpes looks delicious! That looks like a successful event! Great selections of cheese too, I would love to try some of those! !